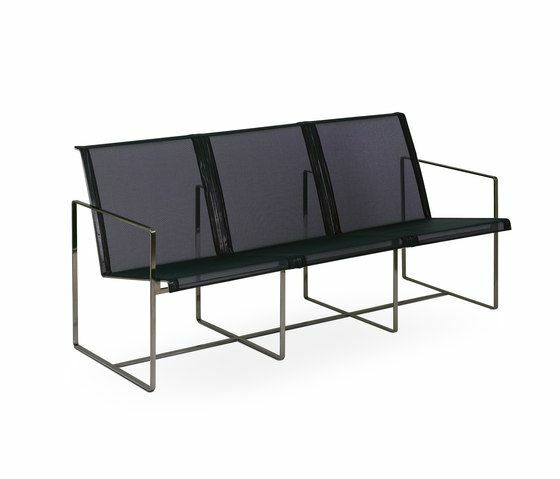 In 2011 the Poltrona Tres was added to the Cima Collection, an extensive range of clean and aesthetically pleasing modern design garden furniture. This garden sofa is pure, minimalist and architectural in design and available in a range of contemporary colours. The high grade stainless steel frame give these interior exterior designer sofas an ultra-modern look, and optimum comfort is provided when used with the Escabel footstool for relaxing in luxury in your contemporary outdoor space. The Poltrona Tres sofa is often combined with the Poltrona garden easy chair or the Pequena sidetable. Designed by European designer Hendrik Steenbakkers, Cima garden chairs are built to a very high quality from the highest quality materials. The stainless steel elements to the furniture are optionally available in an electro polished finish and the seat of the Poltrona Tres is made of Batyline® fabric, which is UV, mildew and stain resistant and has a comfortable spring to it.